This writer is really colour-blind and respects every Religion in the world. Everyone have their own beliefs and their right to practise their own religion and be guided by their own set of rules and ethics in their faith. Every weekend for the past 6 months this writer would use his twitter handle to upload this:- Thank U Malaysia @NajibRazak @PMOMalaysia 4 Religious Freedom Peace & Security @BNfor1Malaysia @1MinDef @Sarawakiana . There will be a number of tweets which are shared to those who are on his twitter lists. Giving more encouragement is the chief administrator of the state the CHIEF MINISTER audie61 calls him previously “Robotic” Nan but who since took office in February 28th 2014 have been very determined in his approach. We salute him for the statements like:- “described the people of Sarawak as “very lucky” because they were not split by race, religion and tradition. “We have been living in peace and harmony and we must keep it that way. Do not follow the attitude of some groups and individuals in West Malaysia who are quarrelling every day. So where do we go from here? We are in no position to judge anyone and only God can judge us. We are posting not to shake the apple cart which have already been shaken and gone through worse turbulent times but to REMIND THOSE BIGOTS,EXTREMISTS AND TROUBLEMAKERS that you are being watched and tracked by all who LOVE PEACE and HARMONY in MALAYSIA. Don’t use Race and religion to champion your POLITICAL CAUSE or OWN EXTREME AGENDA as this will not sell to the majority of people. The pictures that we have put in here will cause a stir no doubt and there are many comments in both of them. They both have got MANY LIKES AND SHARES IN THE FACEBOOK. Asrul Samad have so far garnered 2813 Likes and 4893 shares and 10296 comments while Rakan Bestnye Sarawak (RBS) have 6556 Likes 2308 shares and 529665 people reached with 367 comments. Yours sincerely alone cannot be seen fighting for a truly Multi racial and religious Malaysia and this needs all of us out there to put this people in their place and even CAGED THEM UP. 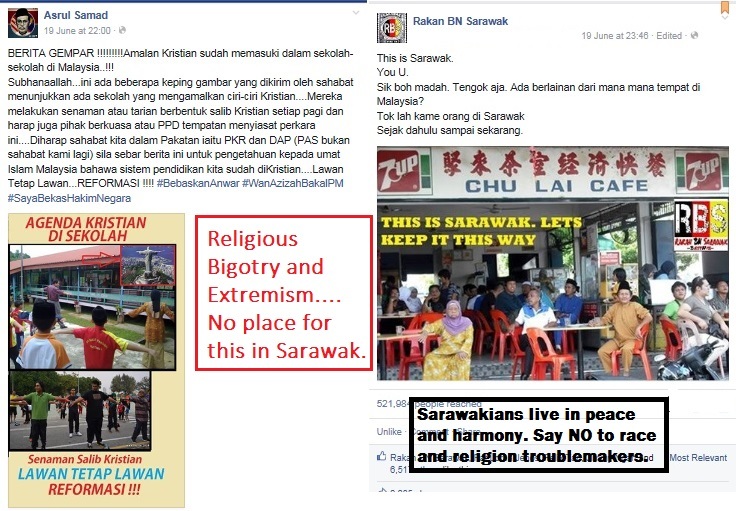 Sarawak certainly don’t want them and nor does Malaysia.